Ba Duan Jin, 8 Section Brocade Workshop 2018 | Tundeworld! Easy to learn this Qigong movements on Sunday, 6/5/2018. They are a good combination of strength and relaxation or dynamism and inertia helps to maintain balance between Yin and Yang, the two principal opposing and interactive aspects, of the body as described by traditional Chinese medicine. It is also helps to improve circulation in the channels and collaterals, and smooth the actions of the joints and the blood circulation. All this has obvious effects in strengthening the body and improving the health. 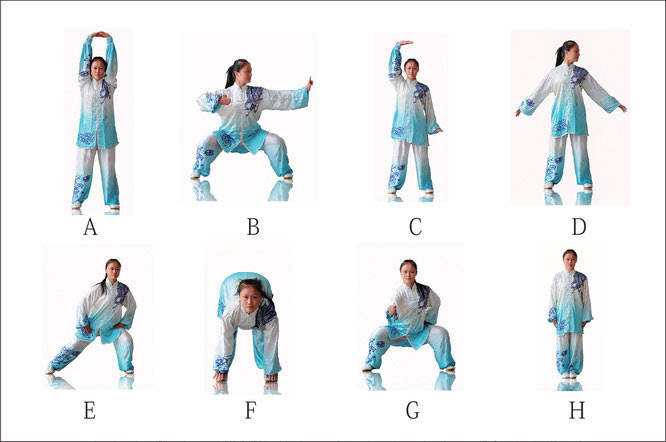 The Baduanjin traditionally contains both a standing and seated set of eight postures each. In the modern era, the standing version is by far the most widely practiced. Do you have unhealthy postures, such as a bent back or hunched shoulders? This routine, Ba Duan Jin helpful to correct them. Also helps to develop the muscles of the lower limps, and enhance the balance and coordination. With improvement of the muscle strength of the forearms and hands, the flexibility of the wrist and finger joints is also enhanced, works for preventing shoulder and neck problems and lot more. Learn this simple but extremely effective ancient set of Chinese Health exercises. The class is suitable for beginners, advanced and people of all ages and levels of fitness. This routine can also be practiced seated making it suitable for anyone with physical impairments or mobility issues. Ba Duan Jin (Eight Gorgeous Sections Exercises) is one of the traditional Qigong exercises. Its creation can be traced back to the Song Dynasty (960 – 1279). This 800-year old exercise, which the ancients likened to beautiful brocade, consists of eight sections, is very popular among the Chinese people. There are different postures such as sitting or standing; each section can be practiced on its own and each targets a specific organ. Ba Duan Jin is an incredibly effective energy balancing technique, very good for energy overload problems. The character of Ba Duan Jin Qigong is gentle, slow, smooth and consistent. The exercise rhythmically combines relaxation and strength, and dynamism and inertia. It combines mind and body to cultivate vital energy. It can be practiced while standing or sitting. With easy movements and impressive effects on the health, it is a gem in China’s health and fitness culture. Ba Duan Jin is part of the New Health QiGong Exercise Series compiled and published by the Chinese Health Qigong Association. As a safe aerobic exercise it features a movement intensity and format in line with the theories of kinetics and physiology. Added ti the traditional eight movements, are sections on the preparatory posture and closing form, making the exercises more complete, standardized and rational. There is a total of 8 movements. Each movement has its benefit and together they stimulate the 12 meridian inside us. It is very easy to master and the benefit is quick to effect. Location -Girl Guide Hall. I marked with red. Early bird booking with 15% discount on training and competition fees if full payment is made by 15 April 2018 - $80.00 OR bring your friend and only pay $72 each. After 15 April 2018 - $ 95.00 OR bring your friend and only pay $87 each. Price includes morning tea and certificate. The Ba Duan Jin qigong(八段錦) is one of the most common forms of Chinese qigong used as exercise. Variously translated as Eight Pieces of Brocade, Eight-Section Brocade, Eight Silken Movements or Eight Silk Weaving, the name of the form generally refers to how the eight individual movements of the form characterize and impart a silken quality (like that of a piece of brocade) to the body and its energy. The Ba Duan Jin is primarily designated as a form of medical qigong, meant to improve health. Ba Duan Jin (Eight Bolts of Silk), this is a kind of dynamic Qigong practice having the characteristics of both Qigong and health-strengthening exercises. It is derived from one of the oldest health-strengthening folk exercises in China, Ba Duan Jin which was created 800 years ago. The Eight Golden Treasure Brocade, Ba Duan Jin is simple and easy to learn, and may be varied in intensity to suit the individual. Once you have learnt it, it is best practiced in the morning or evening in fresh air, for 15-30 minutes each time. Ba Duan Jin Qigong exercise is increased muscular strength and the development of the pectoral muscles can assist in providing a graceful figure. The use of the core muscles will help in the prevention and treatment of kyphosis and scoliosis along with some common chronic diseases such as cervical spondylopathy, pain in the lower back and legs, and stomach ache. 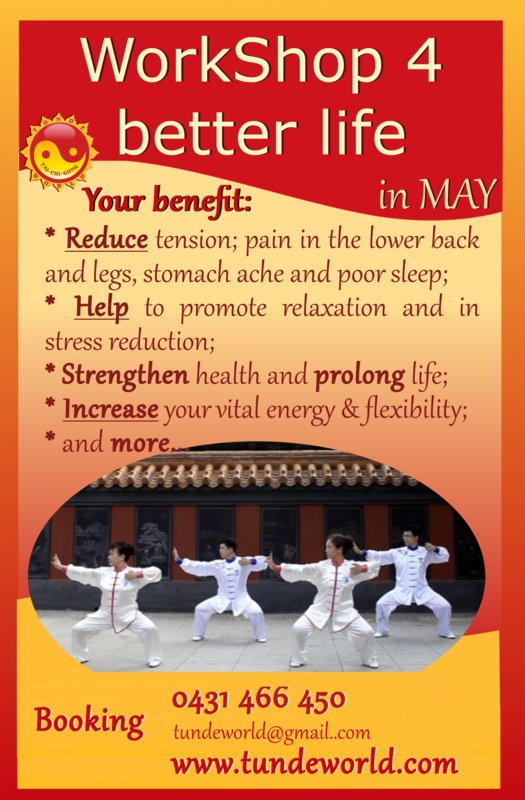 With persistent practice, the Ba Duan Jin can also tone the brain, strengthen health and prolong life. The movements are gentle, relaxed and gracefully extending on the basic of a well balanced stance. The movements are continuous, like flowing water or floating clouds, to instill calmness in the practitioner's body and mind. This help to smooth the internal circulation of vital energy and improve ones health fitness. It is a good combination of strength and relaxation or dynamism and inertia helps to maintain balance between Yin and Yang, the two principal opposing and interactive aspects, of the body as described by traditional Chinese medicine. This series of eight movements and stretches was developed in the early 12th century by the famous Chinese military hero General Yu Fei in order to add sensitivity and suppleness to the strength of his soldiers. Since then it has become one of the most commonly practiced qigong exercises in China. Before starting the first movement take a couple of moments to clear and calm the mind. Stand straight and relaxed with a feeling of lightness at the top of the head. Breathe naturally from the diaphragm and focus the mind on the center of gravity below the navel. Reference: “Ba Duan Jin”, Chinese Health Qigong Association, Public Physical Exercise Press, 2007. If you need to cancel your registration, please notify us immediately. A full refund is awarded when 14 days notice or more, is given prior to course start date. 13 – 7 days notice attracts 50% refund. 6 days or less notice, attract 0% refund. When more than 48 hours notice is given for absence of an in-person class, the student may join the next group when they become available. This is a once only option.